Have you ever spotted an electric car on the street, it is quite impossible to identify such cars as these cars quite resemble gasoline powered cars? If you are an automobile enthusiast, you can probably spot easily an electric vehicle (EV) among many cars, the other way is to spot an electric powered car is the excellent level of silence that these cars have. The beauty lies in the silence of the motor of electric powered cars which does not produce any deadly emissions. The technology of the gasoline powered and electric powered cars is totally different and all the difference lies in the hoods of these cars. If you want to know the working of EV, you need to explore the hood by opening it. The gasoline powered car engine contains many boxes and pipes which looks like a complicated plumbing work but with pure electric cars, the features are totally different and looks like a complicated electrical work. The car which is electric powered uses its motor to power the wheels which will be totally different than gasoline powered cars. The electric motor directly uses electricity and starts rotating, which means the power is instant and this power can be used from the get go. The main problem with EV is when it climbs a steep hill. This energy system is not adequate to propel the car upward on hilly surfaces. This is one of the challenge EV manufacturers are working very hard to resolve. Initially, the electric car motor were powered by normal car batteries which did not have long usage life, but now this issue has been resolved to great extent by using modern lithium-ion batteries that will allow you to drive your eco-friendly vehicle for a longer duration without having to be recharged. 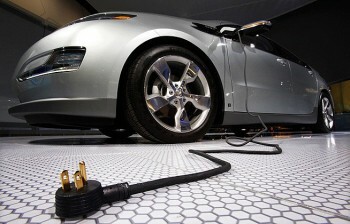 The working principle in the electric vehicle is an AC charger which charges the battery unit. After starting the vehicle, the power is directly passed on from the battery bank to the electric motor. There is a meter which is known as voltmeter instead of gasoline meter normally found in gasoline run cars. The voltmeter shows the level of remaining battery charge which is an indication to get the batteries recharged. Pure electric cars do not have clutches therefore you have limited control on the power output from the motor. Instead of an accelerator, it has a potentiometer that allows increasing or decreasing the torque generated by the electric motor. If you are planning to use air conditioner in your car, there is an additional battery source used for onboard heater. The power windows and other accessories are also powered by this secondary electric power source. As compared to an automobile powered by an internal combustion engine, increasing the speed on an EV will give you a lower mileage because more current is needed to power the motor. Understandably, the present pure electric cars in the market have many flaws. But with the passage of time and improvement in technology, these cars will become more efficient and most importantly become cheaper to buy. Pure electric vehicles are the best alternatives to gasoline which has contributed to the destruction of our environment.